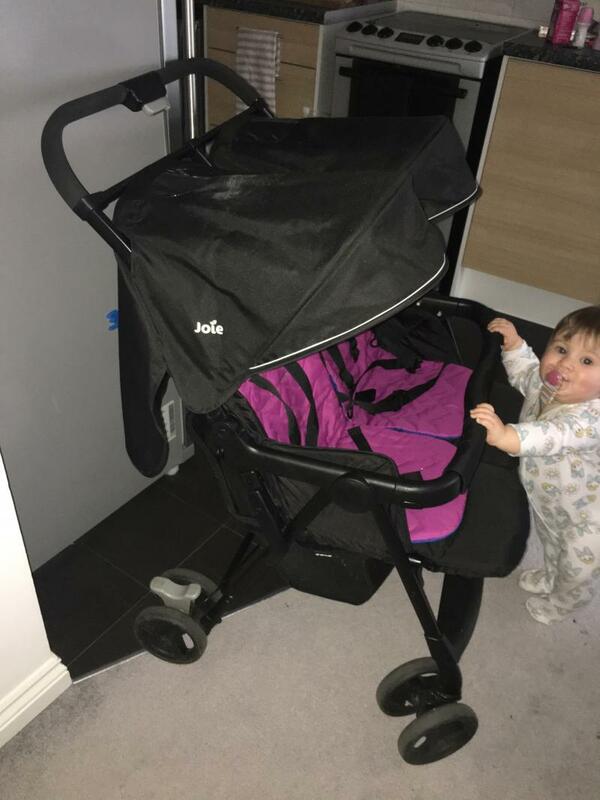 My review of this pram is it is a great pram, it fits through normal doorways, corridors etc. It Is definitely worth the money I only used it for a couple months but it still looks brand new. The wheels are an excellent feature aswell they go through any terrain. 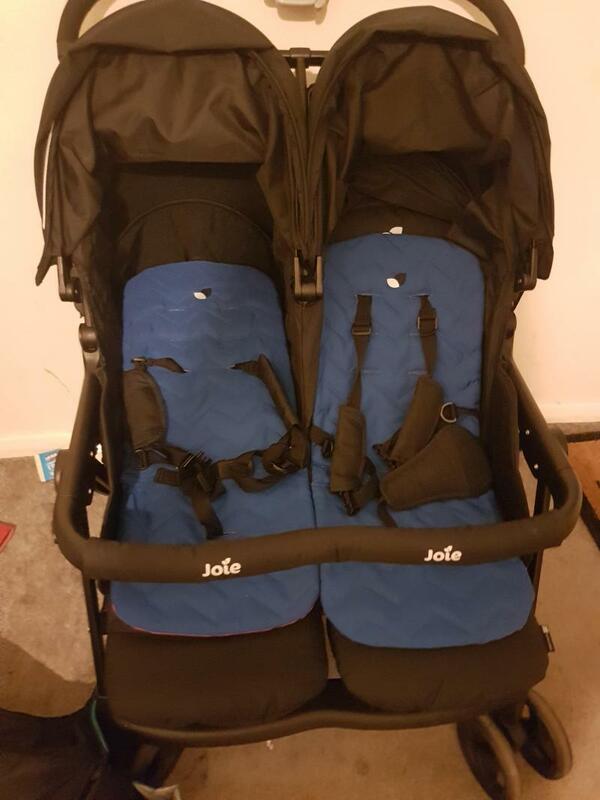 We bought the joie aire for our 2 babies, who were at the time 6 months and 17 months, we needed a double buggy so they could both see the world and one that reclined both seats separately. 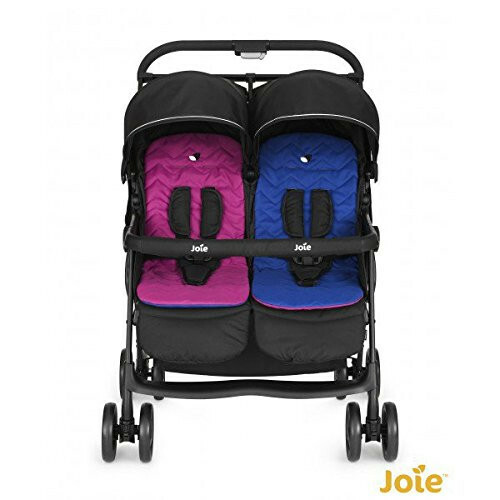 The joie aire was pretty much the perfect pram that fit our criteria, and for such a cheap price too! The easy to fold mechanism means you can fold with one hand, however it doesn’t fold as small as some, which can make it difficult to get in some cars. 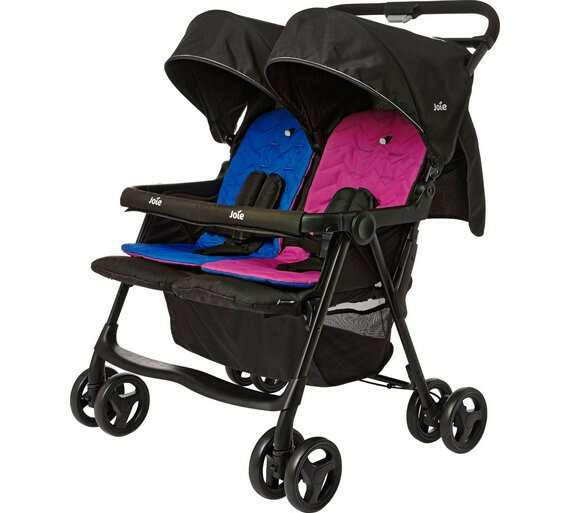 The lightweight frame makes pushing the pram a delight, however the wheels are a little flimsy and eager to spin 360 degrees, even when you don’t need them to - queue awkward crashes and having to waddle through a few door frames! The pram is narrow enough for most standard door frames and I’ve even managed to get it round mosh shops! It’s easy to lay back if baby falls asleep and also easy to sit back up once baby wakes up, the windows in the hood mean you can keep an eye on them even in the rain/wind etc. Our very few cons are ; the plastic frame for the hoods sits right at head height for our youngest and if she falls asleep sat up her head has in the past hit this and left quite a mark. If you only have one baby in the pram for whatever reason (in our case one learnt to walk and gained confidence) it does make the pram a little lopsided to push, but not awfully. And the wheels do sometimes spin unnecessarily which can make the pram dart off in an unexpected direction! Overall, for the price I think the pram is great! It’s done it’s job and lasted several holidays and is still in good shape! Love love love, I use this pushchair with a range of aged children. From 6 months up to 4 years old. 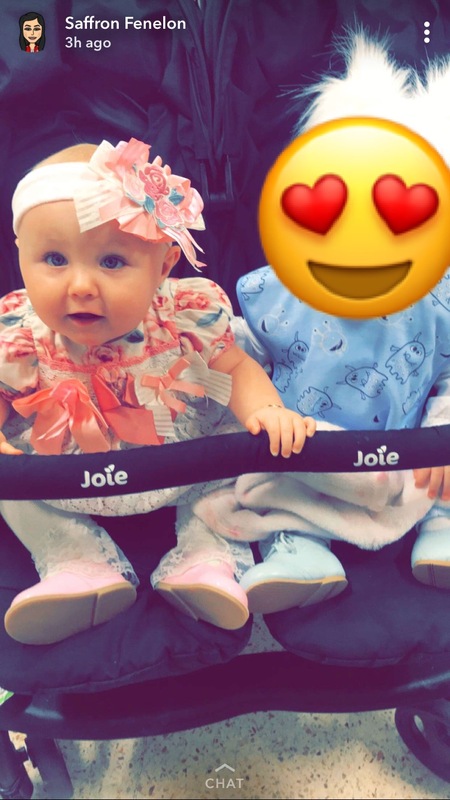 the children are comfortable sitting in the seats and are able to move their legs as they please (one loves to rest their legs on the bar) the foot rests are adjustable which also helps when having older children in the seat. 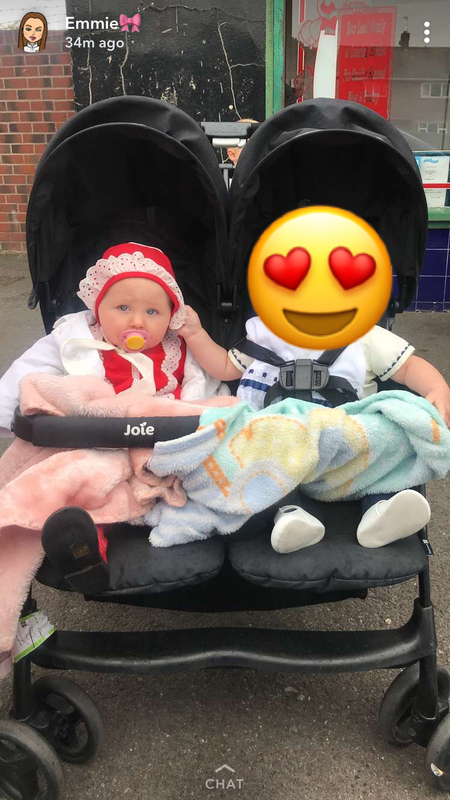 Although I love the pushchair it does have a few weaknesses for me personally but are not a big deal at all really, when the children are sleeping it’s hard to gain access into the basket underneath, and the viewing hole in the hood to see the children I personally cannot see through the thing. Other than that I am happy with this pushchair and recommed it to others! This is a great buggy and last year's. It's light weight and easy to push and travels well across uneven ground. It is a bit wide but folds down small and flat to fit into the boot. It's so easy to fold which is great with a baby and toddler in tow. It's lightweight but sturdy. 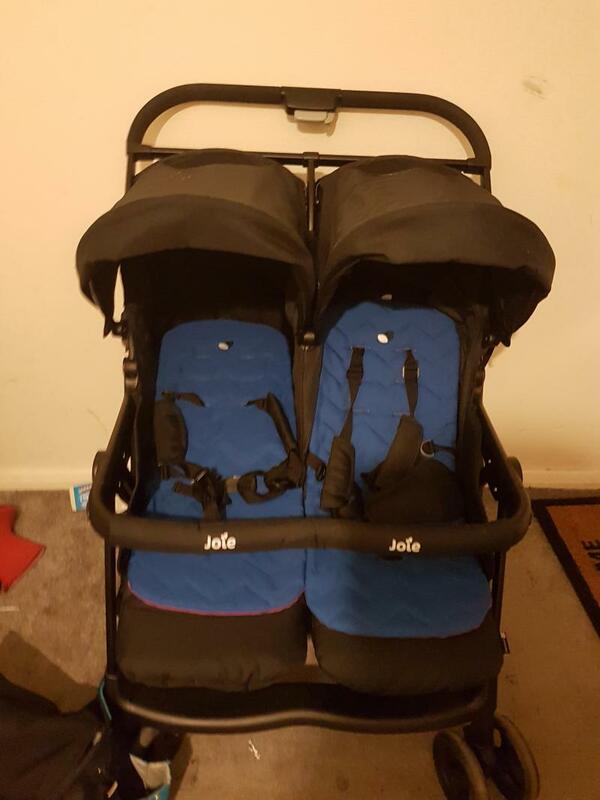 I bought this double buggy when our son was two and half and our daughter was nearly six months. I needed a buggy I could easily get on and off the bus/train myself, or fold down for in our family car. It ticked both boxes as it's easy to steer and get on the bus but also folds flat enough to go in the cars boot. I have hypermobile joint syndrome so struggle with heavy prams/buggies and this one is brilliant and doesn't cause me any pain to push. It's lightweight but is obviously built to last and feels very sturdy. Our son is now 4 and daughter is turning two this week so we no longer needed it. We donated it to our families nursery for the children there and as you can imagine, it gets fair use by a number of children of varying weights, heights and needs. It's still going strong and the kids and staff love it. Highly recommended, especially as it can be used from baby to toddler and they get to sit side by side which is lovely. I find this quite difficult steer, can get it through most doors. Overall an ok pishchair. The universal footmuffs and sun shades really got this well. This is my designated pram for when we go to Disneyland Paris! It’s great! The way it folds it sits perfectly on top of our cases, it’s pretty easy to steer. The only thing the wheels sometimes lock but that’s easily adjusted! I bought this as a second twin pushchair. The first one I had was weak and unsuitable and the twins did not like it. I bought this one because it was spacious and easy to use with one hand! The only down side is that you need a big boot for it ( luckily I have a minivan) so that it fits perfectly. But I have used this many times and really like it! 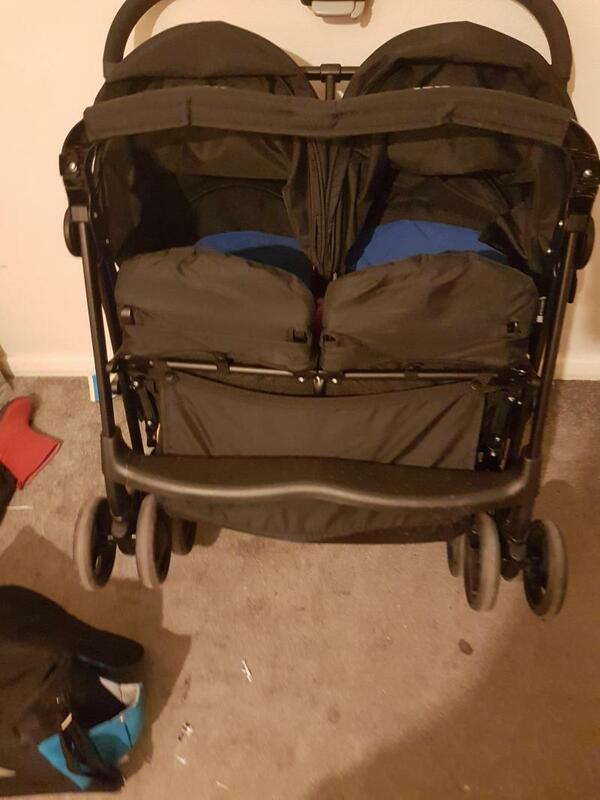 I am a mummy off a 2yr old and a newborn at the time off purchase, i recommend this buggy to anyone, fits in a small fort fiesta boot no problems, reclines for newborn but straps surpports small ones safely. 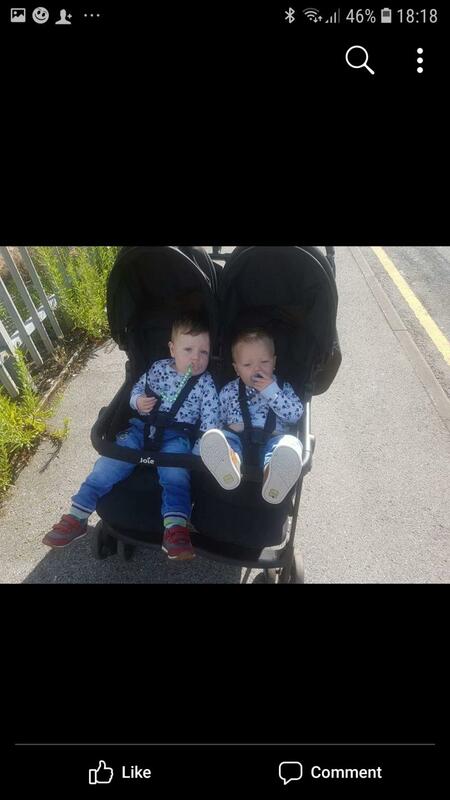 Overall an excellent twin stroller bought for my two under two for travelling and when we are restricted on space. Stroller is sturdy with a large shopping basket. Easy to open and lock mechanism (which I have managed one handed). However we did have to improvise when folded to decrease the gap between the folded frame as no extra clip. As I was worried about it catching and being damaged during the flight. I have this prom a while now, approx 2 years. It’s been good for what we needed. I found that the steering was good and it is very light. Can be used from birth which is also good. My only draw back is that it won’t fit through my front door so when they finally nod off , you have to be very skilled at keeping them asleep whilst getting them out. Overall I would recommend this pram is is very good value for a double. My best baby purchase! I have a newborn baby and toddler. This buggy full reclines for my newborn she’s been in it she’s 2 1/2months old. My toddler fits perfect on the other side. If you need a buggy for the same reason as me my toddler can’t walk on his own without running of. I can keep a close eye on both children through peep hole on the sun canopy. This buggy is easy to fold and fits perfect on our boot. Easy fold, great to push, seats lie flat, large hood & raincover. Seats aren’t overly wide however you would fit possibly 2 3 year olds in comfortably they’re just right next to each other. Both seats recline individually and the hood is a great size too. HUGE basket underneath so great for an everyday pushchair. The liners change over so you can pick you colours blue/pink, blue/blue, pink/pink. This is a great pushchair when you have 2 small children. It's very easy to use, steers nicely and feels light. The basket is pretty big so you can fit lots underneath. It comes with the padded seat covers which can be used on either the pink or blue side. It folds up very easily but I would say it's quite heavy and bulky when lifting into a car. The main negative I've found is that the hoods don't come down very far, just a personal preference as I like to pull it over when baby sleeps. Other than that it's a great pushchair for everyday getting out and about. I love this double buggy it’s so light and easy to steer you don’t even realise there’s children in the buggy it’s that light weight ! I have trouble carrying it when it’s folded to put it in the car or take it the house as it’s quite heavy but other than that definitely worth getting if you have two children. 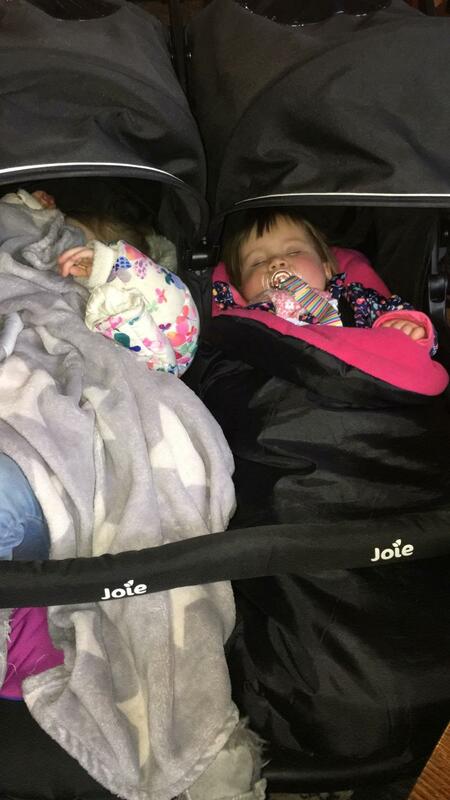 The joie twin is a great side by side pram, however it comprises fitting through most doors easily and the back brake has stopped working after not much use. There are no dividers between chairs so my twins often grab each other. It’s not all bad. The seat positions are great and it’s easy to turn. It’s light and has a great sized basket. My twins enjoy being able to look out into the world. It folds down flat but is wide and doesn’t stand up when folded making storing in hallways challenging. 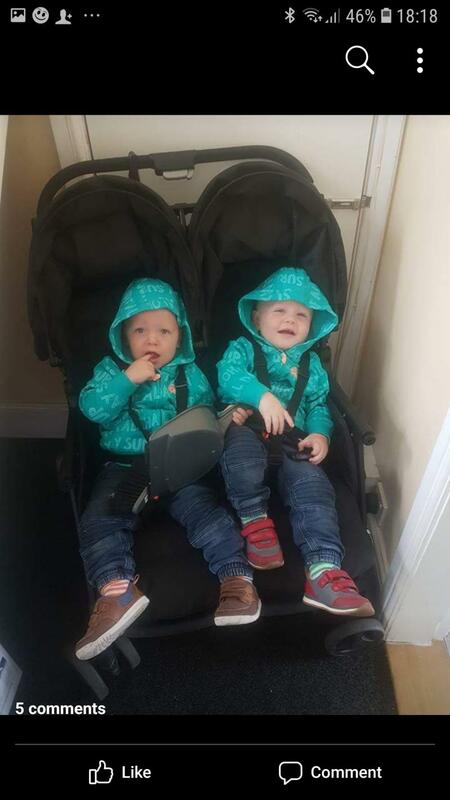 We bought this as a second pushchair for our twins as it folded small and find in the boot of our 7 seater car with all the seats up which is rare. It's lovely to push and its light weight the seats are nice and roomy also. I just wish it was a little bit slimmer as I couldn't get it out my front door up. Shops were not a problem though. Affordable. Light and easy. Easy to fold. Handle a little low. Not majorly sturdy. I love the fact it comes with two reversible liners both pink and blue. It’s really affordable and a great second pram or holiday pram. Not sure I would want to use it every day with my 6 month twins but it’s a great spare and could be an every day pram for older children. Very lightweight and easy to use double compared to others I have had. I love how simple it is to lower and raise the seats with one hand. Only other con is that the rain cover doesn't quite fit over the ends of my tall 2 year old's long legs! 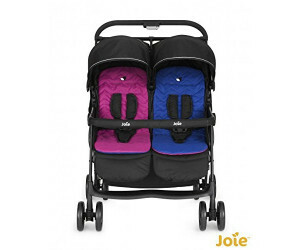 Easily get out and about with 2 babies with the Joie Aire Twin. 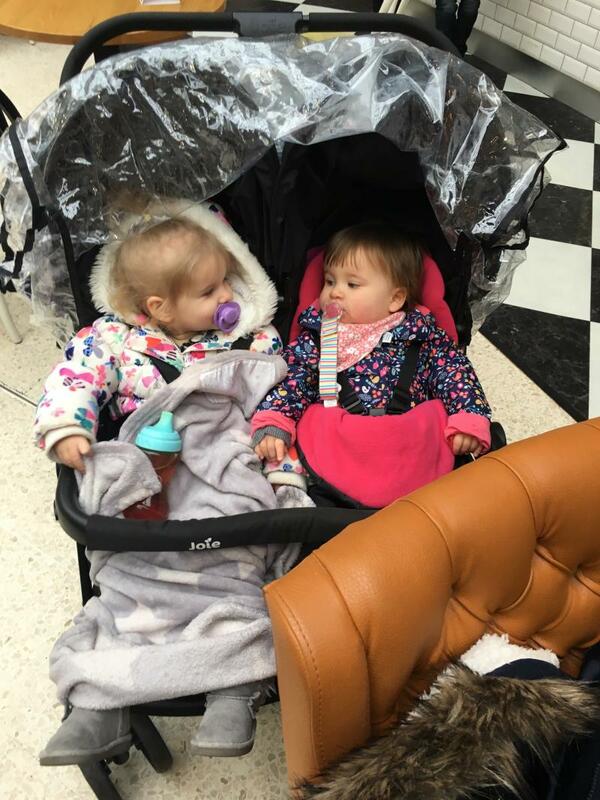 This lightweight side by side pushchair, with its all round suspension, aluminium chassis and lockable swivel wheels, ensures a comfortable ride for everyone. It will suit your needs with independent layback, comfy colour reversible seat pads, and a narrow wheelbase for travelling anywhere.